KANAN's first trip abroad was in 1947.It was a private visit and she took theopportunity to visit studios like the MGM, Warner Brothers and others. 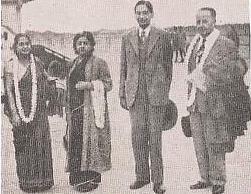 She came across leading stars of the day like Vivien Leigh ,Spencer Tracy, RobertYoung, Katherine Hepburn among others.She developed a close rapport withLeigh who had visited India earlier and had developed a keen interest in theeast. The other places visited by her were New York, Los Angeles,Mexico,Chicago,Washington. 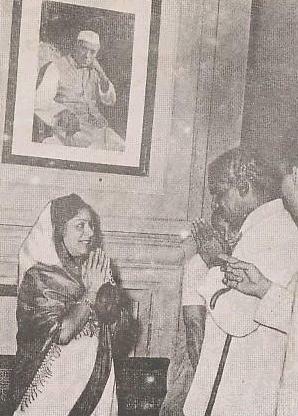 Although a private visit, this trip received media attention for a trip abroad by film stars was rare then.India’s first Independence day on the Fifteenth of August,1947 wascelebrated in London at the Indian High Commission.KANAN was invited to sing and she rendered AMADER JATRA HOLO SHURU…. She was felicitated by The Gramophone Company in this very trip. As producer of ANDHARE ALO she attended the Karlovy Vary Film Festival in Czekoslovakia. 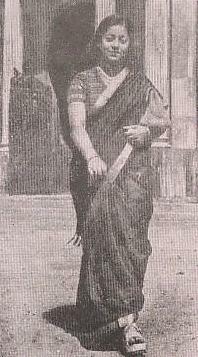 HusbandHaridas Bhattacharjee was also invited as director of the film.